A common thread among most teenagers, at least the ones that I knew, was that you wanted everyone else's parents except your own. In my circle of friends, one friend yearned for parents that were still married and filthy rich, I yearned for parents that would allow me more freedom while another friend yearned for parents that didn't constantly criticise her. I was often pulled into the situation because I was always at her place because her parents gave us more freedom than mine who didn't feel that teens needed any sort of privacy. Her mother was a dear woman to me but she would constantly say to her daughter Sarah "Why can't you lose weight?" at the same time as feeding her cheesecake for breakfast. And that's when things got a little strange. My friend once told me of a story that her mother often recounted to her. She told me that she used to have a twin in the womb but that her twin had died because as her mother has said, Sarah had "eaten all of the food." I was mortified when I heard the story. No wonder Sarah had such a terrible relationship with food. I don't think that you can tell when one twin has eaten a bigger share than the other and I think sometimes, one is just stronger than the other and the other one just doesn't make it (although what do I know, I'm not a doctor). Nevertheless, we could all see it as a sad tactic to get her daughter to lose weight. It's this family that I think of whenever I have anything beetroot because borscht featured regularly at dinner when I would go over as they were Russian. 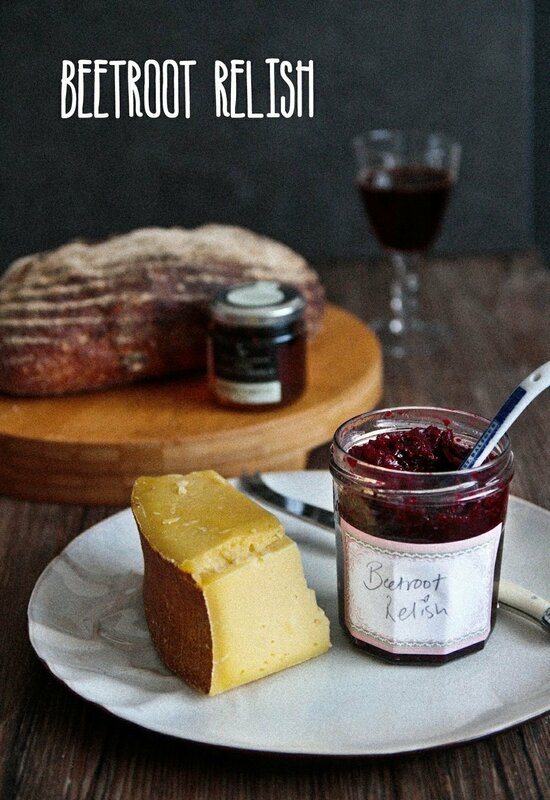 This beetroot relish is a great way to preserve beetroot and serve it up easily and in a tasty way. I bought a kilo of beetroot at the market where it was just $2.80 a kilo. I am a fan of making things that require little physical effort and the idea of grating or chopping half a kilo of raw, hard beetroot and splattering myself and my kitchen with purple juice didn't appeal to me so I used the path of least resistance or effort and baking the beetroot saving the other half kilo for eating in a salad. That meant that the kitchen was warm too with the oven baking which was a nice bonus. This sweet, spiced beetroot recipe is so moreish and doesn't have the earthy flavour reminiscent of dirt. It's sweet but not sticky and jam like although if you prefer a nice sticky marmalade texture feel free to increase the sugar to one and a half cups and add some orange zest. I served this with the roasted lamb rack in a side pot where Mr NQN wolfed it down quickly without leaving me any. I had to hide the jars! So tell me Dear Reader, what sort of parents did you wish for as a teenager? 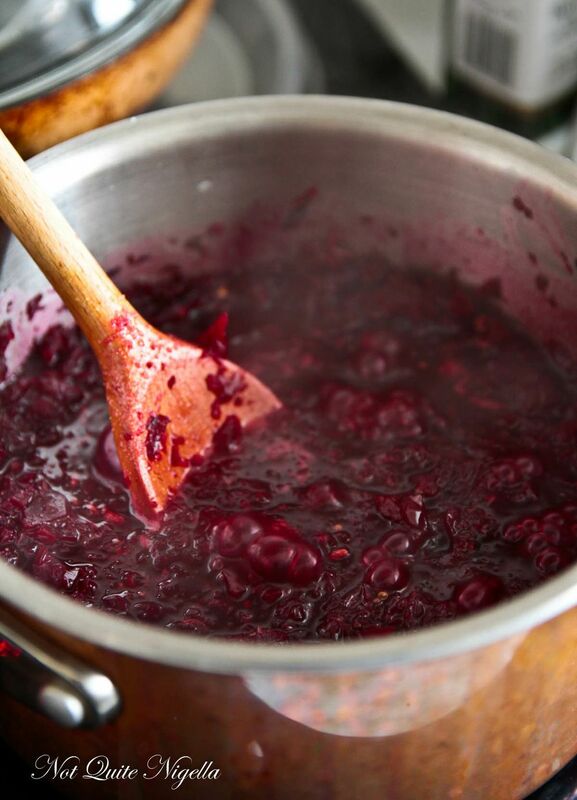 Step 1 - To roast beetroot, wash the beetroot and place in a cast iron pot or a pot with a lid. Drizzle with oil and roll them in the oil to coat and then bake for 1 hour to 1.5 hours (depending on the size of the beetroot). I sometimes leave them in the oven overnight to cool and then peel the skin off the next morning when they're while wearing gloves to stop my fingers staining. 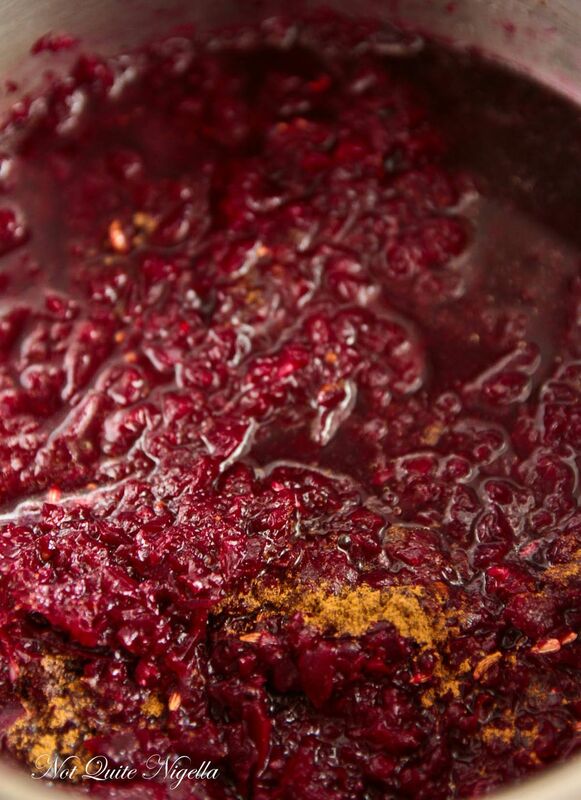 Chop the peeled beetroot into quarters and process in a food processor until you get a rough, grated texture. You can also start with raw beetroot and grate it although the cooking time on the stovetop will be a bit longer. Step 2 - Heat a saucepan on medium to high heat and without adding any oil, add the mustard seeds. They will start to pop. Turn the heat down to medium, add the oil and chopped onion and fry the onion with the mustard seeds until translucent. Add the sugar, water, allspice, cinnamon, vinegar, salt and beetroot and stir to combine. This will cook quite quickly in about 15-20 minutes as the beetroot is already roasted. 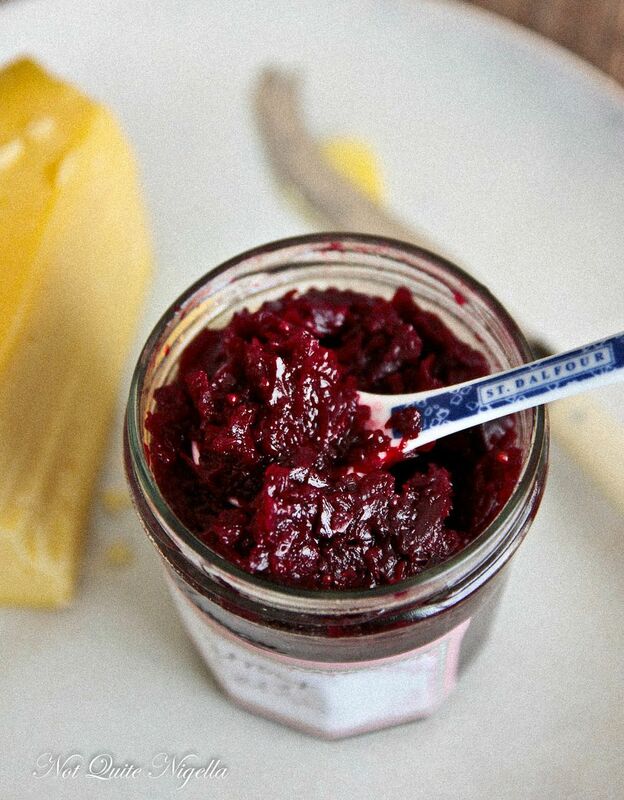 If you're cooking with raw, grated beetroot, check on the texture and it may need maybe 30-40 minutes. Simmer with the lid off to drain any excess liquid (you can keep a little syrup in it if you want). Step 3 - To place in preserving jars, preheat oven to 180C/350F. Place jars and heatproof lid in the oven for 10 minutes. Carefully remove and ladle the relish into the jars while still hot. Carefully using oven mitts or thick tea towels, place the lid on very tightly and upturn the jars for 10 minutes. Then turn right side up and press down on the "bubble" on the lid and the seal should depress. featureMake Your Own Mango Chutney! feature Make Your Own Mango Chutney!